Iga Bakar Recipe Ketchup and How to Make it .But of course, you also can make themselves at home Iga Bakar. How to make it easy anyway, you just follow the instructions recipe sauce grilled ribs and how to make it. For example we will create soy barbecued ribs easiest. Actually there is another variety of barbecued ribs like honey barbecued ribs to grilled ribs black pepper. Everything was delicious and worth a try. For starters we tried to make soy sauce grilled ribs first. 2 tomatoes, cut to shape and size according to your taste. First boiled young goat ribs with water mixed with seasoning mashed. Add salt, boil the ribs approximately 15 minutes, until soft and cooked, then remove and drain. Grilled ribs with a non-stick frying pan until lightly browned ribs second surface, then remove. Heat the cumin oil. Sauté the onion, peppers and tomatoes are sliced ​​until wilted. Then enter the last rack of lamb and stir until well blended. Add soy sauce and white pepper powder and saute until well blended, then lift and serve. Grilled rib sauce was delicious and tender ready to be served. 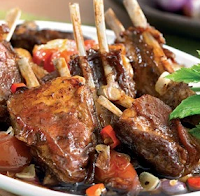 For those of you who want to try the recipe ribs grilled with soy sauce and how to make it at the top, to note a few things like the amount of cayenne pepper can be adjusted to taste and cumin mnyak can be replaced with butter or margarine. As well as to make the meat more tender rack of lamb, after being washed, smeared water young pineapple in the chops. Let stand 2 minutes, then washed with clean water. 0 Komentar Untuk "Iga Bakar Recipe Ketchup and How to Make it"